All taxpayers having Income more than Rs. 5 Lakhs are now mandatorily required to submit their Income Tax Return online using appropriate ITR. Those taxpayers with Income below Rs. 5 Lakhs can either submit their Income Tax Return online or can submit the physical forms as well. Due date of filing Income Tax Return for the AY 2015-16 has been extended by CBDT from 31st July 2015 to 31st August 2015. If you can not file the return within the due date, you can still file the belated return u/s 139(4) upto 31.03.2016 without any penalty. Return can also be filed online till 31.03.2017 but subject to a maximum penalty of Rs 5000/- u/s 271F. Filing Income Tax Return has become very easy. CBDT has introduced simplified ITR for Salaried persons in “ITR-1 (SAHAJ)”. To make it more convenient CBDT has introduced Quick E-file option. This option is only for “ITR-1 (SAHAJ)” and “ITR-4S (SUGAM)”. To file online return you need to Register your PAN. Registration of PAN is a simple process. Always give your own Email ID and Mobile No. during registration and remember your password. Never allow your tax Consultant to give their Email ID and Mobile No. Maintain your Income Tax File Properly by filing your Income Tax Return regularly and keeping a record of Income and Investment declared by you in the Income Tax Return. You can view 26AS and keep track of TDS deducted from you. You can periodically check whether the Income tax Deducted from you has been credited against your PAN or not. This is very Important since many times due to error in filing TDS return (Like Quoting wrong PAN) TDS does not get credited in 26AS. So by checking 26AS periodically any such case can be detected at an early stage. From your Income Tax Login you can download all the Income Tax Return of earlier years. Only electronically filed return can be downloaded. So in case you filed Return Online and one fine day you notice that you have lost the ITRV, there is no need to worry. Just login and download the ITRV online from Income Tax Website. You can check the status of your refund online from your login. You can also file online Rectification request u/s 154. You can check the Status of Rectification request. You can request for intimation u/s 143(1). You can also submit your response to outstanding demand, if any. You can make refund re-issue request. You can check your Pending Actions Status on the Dashboard. You can update your Address, E-mail ID and Mobile No., if required. Who CAN USE this Return Form? NOTE: Further, in a case where the income of another person like spouse, minor child, etc. is to be clubbed with the income of the assessee, this Return Form can be used only if the income being clubbed falls into the above income categories. So if any Income is not falling in the above category then ITR1-SAHAJ can not be used. Who CAN NOT USE this Return Form? Income from Business or Profession. For Income from Business or Profession ITR-4 or ITR-4S (SUGAM) is used. Income from a Partnership Firm. Partner of Partnership Firm are required to file Income Tax Return in ITR-3. This Return Form should not be used by an individual whose total Income for the Assessment year 2015-16 includes Income from Business or Profession under any proprietorship. In such case ITR4 will be applicable. ITR-4 can be used by any Individuals or HUF who is earning Income from any Proprietary Business or Profession. Income from Salary, Income from House Property, Income from Capital gain and Income from Other Sources can also be declared in this retrurn. This Return Form can also be used by an individual or an Hindu Undivided Family (HUF) who is a partner in a firm and also carrying out a Proprietary Business or Profession. From the past two years, the Tax Payers were using ITR 2 or ITR 4 if the exempt income was more than Rs. 5000. This created a lot of debate and dilemma among Tax payers, whether to file ITR 2, even they receive exempt HRA allowance, which is normally more than Rs.5000. This year, it brought a great sigh of relief. From now onwards, any Tax Payer enjoying any amount of exempt income such as PPF Interest , House Rent Allowance etc. 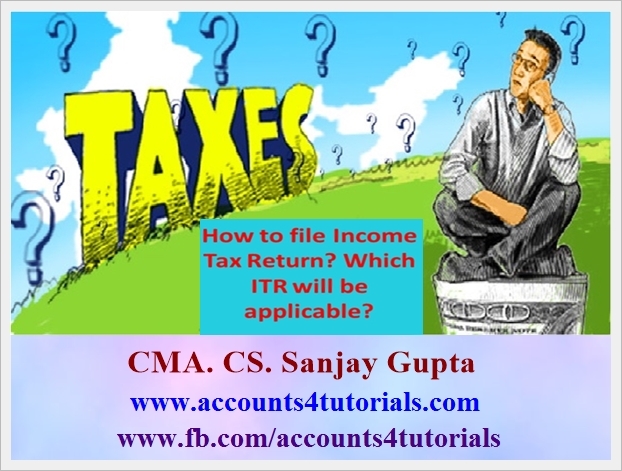 can file ITR-1or ITR 4S. However, Payers who are enjoying the Agricultural income above Rs.5000 are still required to file ITR 2 / ITR 4. A new system of verification has been rolled out which is called as Electronic verification. In this system, the Tax Payer will receive a verification code (similar to One Time Password (OTP)) on Payer’s Mobile number which is associated with Payer’s Aadhar card. The Aadhar Card number is also required to be mentioned in the ITR. Once the Payer enters the verification code), the e-filing will be verified. Therefore posting ITR-V to CPC, Bangalore is not required if the Tax Payer opted to file his tax return either through Electronic Verification System or with Digital Signature. In all other cases i.e. Aadhar Card Holders or who don’t file through Electronic Verification system are still required to follow the old mechanism of sending ITR-V to CPC, Bangalore. The new Income Tax Return also has field for optional information about Aadhar Card number. You have to select whether you have Aadhar Card or not. If you select yes then you have to mention your Aadhar Card No. Giving Details of Multiple Bank Account No. In New ITR, details of all the bank accounts (excluding accounts that have been non operational for over three years) held in India at any time during the previous year needs to be given. Check box to indicate the bank account in which the taxpayer prefers to get the refund. In Return Filed under section new option “Under Section 119(2)(b)” has been newly inserted. So once delay in filing of Income Tax return is condoned, the return u/s 119(2)(b) can be filed online. which form is applicable to an individual working as an legal retainer on contract basis and is having form 16 a and tax status is tax refundable? File Income Return Online for Free| LegalRaasta | TaxRaahi- File ITR online for free. TaxRaahi, a unit of LegalRaasta is India's easiest and most relaible site to file income tax returns online.